Chances are your business requires the use of a commercial vehicle to transport your things and stuff like employees and equipment. With every trip comes the risk of accidents, injury, traffic violations, property damage, loss/theft and lawsuits. That's why it's important to know about the different types of commercial auto coverage available. Our independent insurance agents are here to eliminate the hassle of searching on your own by walking you through a handpicked selection of top policies for you. Commercial auto insurance protects any vehicles used for business purposes against property damage and liability. This includes injury to your employees, passengers, and other people/properties involved in an accident with a company vehicle. Is Commercial Auto Insurance Mandatory? In most states, yes. All registered vehicles are required to have liability coverage – personal auto policies will not cover business vehicles. An independent insurance agent will know about your state’s laws and be able to make sure you’re street legal. Commercial auto insurance is set up differently from personal auto policies and designed specifically for businesses. That being said, if you don’t want your company to risk a door-closing disaster, you will get the commercial coverage needed to protect you and your employees against claims caused by an accident. 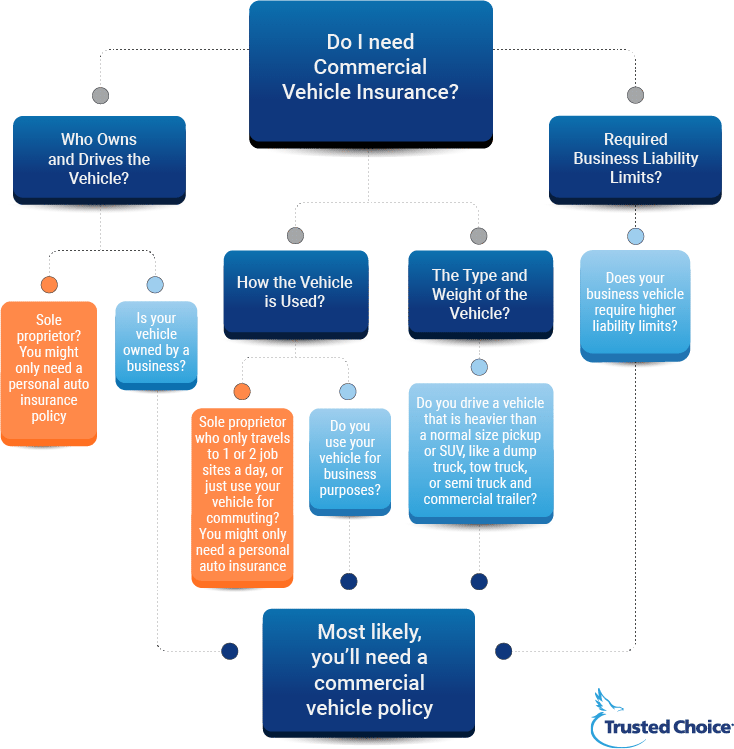 A commercial auto insurance policy is designed to be flexible for all kinds of vehicles and protects against a number of risks that are involved in owning and driving a business vehicle. Collision: Covers costs related to a collision like repairs to the vehicle. General Liability: Covers damage to property or injury to others involved in a collision with the business's vehicle. Comprehensive: Covers damages not related to a collision like fires, vandalism or fallen objects like trees. Loss: Covers costs if the vehicle is stolen. Owned Vehicles: Covers all aspects of vehicles owned under business's name. Non-Owned Vehicles: Covers vehicles not owned by the business but driven by its employees like a salesperson's personal car. Hired Car: Covers any vehicles that are rented by a business. Premiums for commercial vehicles will vary based on many different factors, from the value of the vehicle used to the history of who is driving it. The type of vehicle used: A commercial car could be close to or just over $1,000, while a commercial bus could be closer to $35,000 - due to the increased risk with more passengers on board. Driving history/records of employees: Coverage will be cheaper for those employees with squeaky clean, neat and tidy driving histories, whereas those with more colorful, violation-heavy records will drive up premium costs (no pun intended). Value of the vehicle: More expensive vehicles require more expensive coverage, simple as that. Time on the road: The further your employees have to travel, the longer they'll need to be in the vehicle (duh), which means an extended risk of accidents, etc. Longer commutes in commercial vehicles means pricier premiums. Size of business and its location: How many company vehicles your business needs to insure will obviously affect your policy and its cost, as will the location of your business. For example, being located in a high-crime city will require more expensive coverage. The destination of your commercial vehicles: If your employees will be playing a game of road chicken driving through the packed streets of Chicago or N.Y.C., you'll be paying more than if they're leisurely driving to a rural area/small town while listening to an audio book. Our awesome agents will review your needs and help you evaluate which type of commercial auto insurance makes the most sense for your business. They'll also compare policies and quotes from multiple insurance companies to make sure you have the best protection out there. They'll hook you up - in a comprehensive and affordable way. Insurance policies are complex beasts, searching through options can be confusing, time consuming and frustrating. An independent insurance agent's role is to simplify the process. They will make sure you get the right coverage that meets your unique needs and will break down all the jargon so that you understand exactly what you're getting.